CINCINNATI -- The second-in-command of the Cincinnati Police Department has been "forced out" and accepted a buyout, according to the police union president. 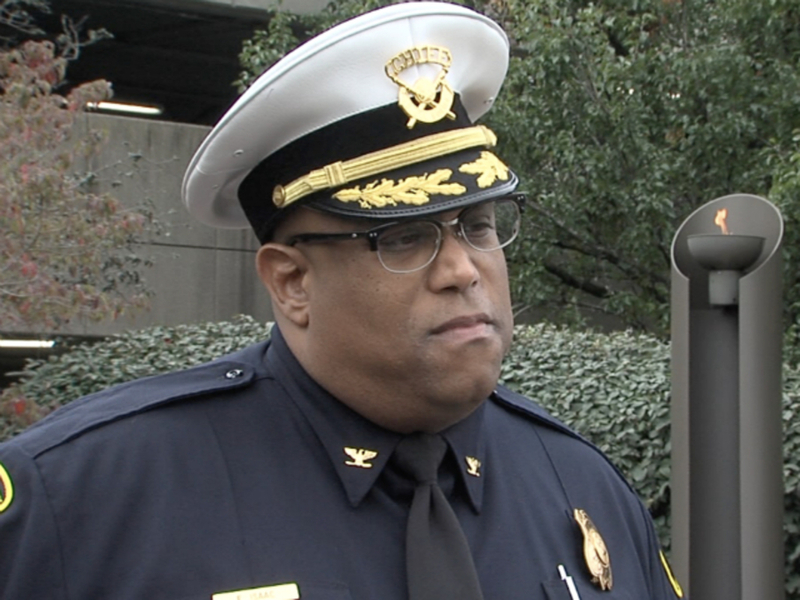 City leaders told Assistant Chief Dave Bailey Tuesday afternoon that he will be placed on administrative leave, Fraternal Order of Police President Dan Hils said. Bailey's removal comes the day after Cincinnati City Manager Harry Black said a "rogue element" within the police department was undermining Police Chief Eliot Isaac. Hils described the leave as a buyout that will continue roughly 18 months, through the end of Bailey's police service. Bailey has worked with the Cincinnati Police Department for more than 30 years. "I can tell you that he truly lives his work, this is his life," Hils said. City Manager spokesman Rocky Merz said he could not confirm Bailey's administrative leave. The city solicitors' office, which Hils said placed Bailey on leave, declined comment. While Bailey's dismissal has drawn rebuke from the FOP president, the Sentinel Police Association released a statement Friday morning supporting Isaac. The Sentinels represent more than 200 of the city's minority police officers. "We have the utmost confidence in Chief Isaac," Sentinel President Louis Arnold Jr. said. "We think he's doing a very good job of serving and protecting the citizens of Cincinnati. The latest crisis isn't just revealing cracks inside the police department. It could also point to a brewing fight at City Hall. Vice Mayor Christopher Smitherman said Bailey's ousting is so troubling, city council may need to reduce the city manager's power. "This is very unfortunate that I would learn from the news about his employment status and only confirms to me that we must move Cincinnati to an Executive Mayor form of government," Smitherman, an independent, said. "The leaders making these decisions must be directly accountable to the people of Cincinnati." Councilman Chris Seelbach is not happy with Bailey's departure, either. "I’ve worked with Lt. Col. David Bailey for over six years now. He’s a good guy who has served our City well. Disappointing to again see City Manager Harry Black dismiss someone with little respect for their service," Seelbach, a Democrat, tweeted. Infighting between police leaders and Black has played out in public view since late 2017. The trouble started in November, when Black made a late-night phone call to Hils. During that phone call, Black accused Bailey and Hils of intentionally blocking work the city's Citizen Complaint Authority, which reviews complaints against police officers. Hils released a recording of the phone call to local media. "Look, all the bulls*** aside, you are involved with Bailey in obstructing the CCA, OK?" Black said during the call. "And what I'm saying to you is that if you guys don't stop, I, as the city manager, will walk away from the (Collaborative Agreement) refresh and I will let the entire world know why I am doing it -- it will be because of you." The city's collaborative agreement is a court-ordered document that lays out standards for the police department's relationship with the community. Fast-forward to Wednesday: Black called a leak of the police department's internal audit of overtime proof that an insider is working against the police chief. The audit, which Bailey authored, was first leaked to the Cincinnati Enquirer. Black said the leaks were part of a racially-motivated effort to undermine both him and Isaac, both of whom are black. That draft overtime audit was released the day after Capt. Bridget Bardua filed a sexual discrimination complaint against Bailey and two other officers. That draft audit lists Bardua as one of the city's top overtime earners. “It reinforces my ongoing concern related to a rogue element within the department that seeks to be disruptive and insubordinate," Black said in text messages sent to council Wednesday. He also told city council he planned to ask the United States Attorney's Office to investigate the leak. The next day, Bailey was notified of his ousting. In an email, Mayor John Cranley asked for more details surrounding Isaac's decision to remove Bailey from his role. "I wish the two of them could work this out," Cranley wrote. "Crime is down right now and I believe both deserve credit. This is sad." Black informed the mayor the "ongoing personnel action" came from Isaac, Cranley wrote. It's a stunning change for two police officers -- Bailey and Isaac -- who once had a close, working relationship, Hils acknowledged. In fact, city documents show Isaac vouched that former Police Chief Jeffrey Blackwell had treated Bailey unfairly in 2015 . When Black fired Blackwell, he used some of those allegations as grounds for his firing. Isaac became police chief in 2015, following Blackwell's firing. At some point after, Isaac and Bailey's relationship changed, Hils said. "I don't know what exactly transpired to start things going south," Hils said of their relationship. "But, obviously, it's gone very far down south." WCPO reporter Joe Rosemeyer contributed to this report.